According to the Customs Notification No.SI/MISC/09/2009-EXP (HQ) Dated: 15-10-2015, It is noticed that during an examination or an assessment, any document is found fake and tampered so the Clearing Agent or his authorized person pretend his innocence on the pretext that he/she was not aware of any forgery or tampering in documents. 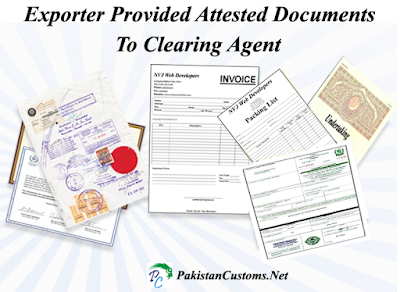 Now exporter will provide complete attested documents (Invoice, Packing list) to clearing agent and in these documents exporter will also mention that provided documents are true, correct and genuine. Clearing agent will obtain an undertaking from the exporter that documents are provided by him-her are correct,true and genuine. Clearing agent also attached same attested documents in Weboc, these attested export documents saves clearing agent against legal action if any misdeclaration, tampering or fakes are found by customs officer. This requirement shall be applicable on G.Ds filed on or after 26-10-2015.